Our archive of Campsis Newsletters from 2000 to 2016 is located here. Eucalypt is the AAFGB bi-annual newsletter produced in May and November and is an important means by which the Association and its members keep in touch. Eucalypt is also an excellent resource document providing news on the ideas, innovation, challenges, events, successes and failures of the members who contribute articles. 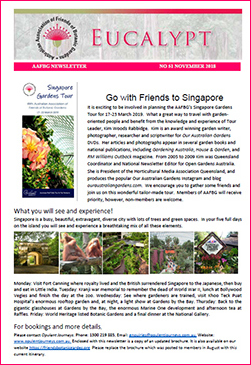 Information from the Committee's activities, Botanic Gardens of Australia and New Zealand (BGANZ) and other matters of interest to Members are also included. Originally called Campsis, the newsletter was renamed in 2015 to correspond with the AAFBG's new name and logo. Members are notified well in advance of each publication to prepare and forward their contributions. Photographs and information about important calendar events are also very welcome. Contributions are required by 30 March for the May issue and by 30 September for the November issue. Members receive both an electronic and posted copy. Eucalypt is currently produced by members of Friends of ANBG Canberra on behalf of the AAFBG Committee, with the distribution by the AAFBG administration. Eucalypt articles are forwarded by email to or by post to Anne Rawson, Friends of ANBG, GPO Box 1777, Canberra ACT 2601. Click on the item to view as a pdf (portable document file). Get the latest version of Adobe Acrobat Reader. Eucalypt! Edition 51 of our newsletter. Reports from the President Dennis Ayliffe, Secretary Elizabeth Gilfillan; and Admin Officer Ro Noone.